On October 10, 1973, following months of pressure and scandal, Vice President Spiro Agnew turned in his letter of resignation to President Nixon (who was soon to follow him) becoming only the second vice president to resign. Michigan representative Gerald R. Ford took his place as vice president on December 6, 1973. Agnew began his political life as a liberal Democrat and ended it as a law-and-order Republican who pleaded nolo contendere (no contest) to charges of tax fraud. He once called the media “nattering nabobs of negativism” and found a political base with both social conservatives and what would later be called Reagan Democrats. He rose quickly from a mere county executive of Baltimore County in 1962 to the Republican candidate for governor of Maryland in 1966. The Democrats nominated a race-baiting candidate and Agnew, running to the left of him, won becoming one of the first Republican governors south of the Mason-Dixon Line since the Civil War. Just two years later, Nixon chose him to be his far-right, hippie-bashing, anti-intellectual attack dog – a role he (along with speechwriters William Safire and Pat Buchanan) clearly relished. In fact, he was a hero to many and the subject of one of the first fads of the decade: T-shirts and other products sporting his image were mass-produced. To his credit, Agnew refused royalties for merchandise with his likeness and instead asked that any proceeds go to aid families of American POWs(prisoners of wars). As Richard Nixon’s vice president, Spiro Theodore Agnew served from 20 January 1969 until 10 October 1973, when he resigned over matters unrelated to the Watergate scandal. Agnew, the son of Greek immigrants, grew up in Baltimore, Maryland, where he began practicing law in 1949. 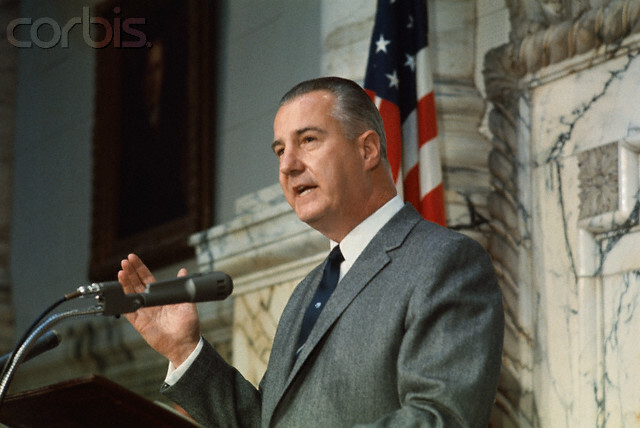 From 1962 to 1969 he served as a county executive in Baltimore before being elected governor in 1967. As Nixon’s vice president he was not closely involved in policy decisions, but he was a media favorite for his staunch defense of the Vietnam War and his colorful attacks on war protesters, the press and political dissidents. Agnew’s fiery rhetoric became legendary: he famously called the press “nattering nabobs of negativism” and referred to war critics as “an effete corps of impudent snobs who characterize themselves as ‘intellectuals. '” After Nixon and Agnew were elected to a second term, Agnew became the focus of an investigation by the U.S. Attorney’s office in Maryland for financial irregularities while he held state office. Rather than face trial, Agnew resigned and entered a plea of no contest to charges of evading income tax. He was sentenced to three years’ probation and fined $10,000. After he left office Agnew avoided publicity and went into business as an international broker. In 1981 he was ordered by a Maryland court to repay more than $248,000 to cover bribes he took while in state office. A defiant Agnew spent most of 1973 deflecting attention away from the growing Watergate scandal with his own troubles. He was accused of receiving kickbacks – illegal payments – from contractors who wished to do business with the state of Maryland while he was governor. The charges soon expanded to include payments he received while vice president. He claimed the charges were “damned lies” and vowed never to resign. Some cynics saw the selection of Agnew as a running mate as Nixon’s insurance against being assassinated. Considering all of the assassinations in the sixties, any kind of insurance would have been prudent. But even Nixon-haters were glad it never came to that. He was a lightning-rod for liberals and Agnew’s troubles – no matter how damaging to the Republican Party – certainly helped keep Nixon’s troubles off the front page. That is, until Agnew had to resign. Agnew pleaded no contest to charges of tax fraud. Ironically enough, the charges stemmed not from having received kickbacks and bribes as he had been doing for the better part of a decade, but for not reporting them on his income tax returns. In typically brash Agnew style, he apparently had them deliver the illegal payments – which he called legitimate political contributions (in unmarked envelopes containing as much as $20,000 at a time) – directly to his vice presidential office! When you believe you are above the law, there is no reason to make such transactions any more complicated than they have to be. While you or I would have spent five to ten in the pen, Nixon’s Justice Department took pity on him and let him off with a fine and three years probation. The puny $10,000 fine only covered the taxes and interest due on what was “unreported income” from 1967 even though there was evidence that the payments continued while he was vice president. That sweetheart plea bargain was later mocked as the “greatest deal since the Lord spared Isaac on the mountaintop” by former Maryland Attorney General Stephen Sachs.